When asked about Lombok, the beautiful Indonesian island, most folks instantly imagine temples and beaches. That’s pretty accurate, actually, and today we’ll talk about the breath-taking Bayan Beleq Mosque. It’s the pride and joy of the locals and plays a very important role in their history. First of all, I gotta mention that it is officially the oldest mosque in Lombok, and, according to reports and legends, it was built almost 400 years ago – back in 1634, to be exact. I bet now you can imagine why it holds such a strong value among the indigenous population. Religion and traditions have been guiding these people for centuries, with the sacred landmarks supporting them on every step of the way. If you’re an experienced traveler, then you know better than me that for us to enjoy a certain tourist spot to the fullest, we need to learn more about it. Because without some knowledge, some background, every single temple/mosque/other ancient building on the island will look the same. Don’t let your own ignorance (or, rather, lack of culture) ruin what could be a wonderful trip. The Bayan Beleq Mosque is definitely worth your while. So, let my review teach you a little bit more about this place. I promise you: at the end of this article, this mosque will become your most favorite sport in Lombok. Ok, let’s roll! When I was still planning my trip to the legendary island, my tourist friends that had already been there more than once, recommended visiting this Mosque. Obviously, that got me excited on many levels and I started to consume whatever information I managed to find on the Internet. The first thing you need to understand is that it’s not “in your face”. The landmark’s location is known to all the local men and women, but for a foreigner, it might be a bit challenging to find it. Don’t forget to check out the map and the instructions on how to get there at the bottom of this article. For now, let’s just try to understand what it has to offer to the regular tourist. The atmosphere at the Bayan Beleq Mosque is magical. Like any other ancient and important place of worship, it’s not trying to look “trendy” or anything like that. It’s one of those places that you need to spend some time on the map to find (or, just read this review). Here comes the interesting part: the mosque is almost entirely made of – you’ll never guess it – bamboo. That’s right! On your way to this landmark, you might meet little kids that “attack” the foreigners with millions of questions. Even if you don’t know a single word in Sasak, I’m sure you’ll find a way to communicate with these lovely children. Happy and full of life, they are the future of Indonesia – that’s what one of the elders told me. Somewhere on the mosque’s territory, there’s an old graveyard, but I can’t actually tell you who’s buried there because while the western folks simply don’t know the first thing about it, the locals won’t be able to explain it in English. But something tells me that they wouldn’t have built it unless it carried a religious value. It’s worth noting that since 1634 – the year the Sasak folks built this now-iconic Bayan Beleq Mosque – very little has changed. Now, while that is a good thing in terms of “historical precision”, as a good buddy of mine likes to say, it’s obvious that the building is kinda shabby. If you’ve got a couple of dollars to spare, don’t be greedy and make a donation. I know I did. If you’re traveling with a partner and/or a noisy company, the trip to this landmark will be entirely different from the solo experience. You gotta understand that places like this one require all of your attention. Otherwise, it will be like I said in the beginning: just another cute old building in the middle of nowhere. I’m not saying it’s not fun to do some sightseeing with a group of friends, but just take my words into consideration. About 90 percent of the island’s population is Muslim. The Sasak people I mentioned above are the true kings of queens of Lombok, and the Bayan Beleq Mosque is a sacred place for them. These people are very friendly and invite folks of all nationality, race, color, and creed to visit their mosques, temples, and other important landmarks. That’s admirable, at the very least. The name of the man that single-handedly built the Bayan Mosque is Syeh Gaus Abdul Razak. A Muslim man himself, he dreamed of strengthening his faith and sharing his knowledge with others. The walls are only 125 centimeters high; they are made of bamboo, while the foundation is made of stone. The top of the roof resembles a crown, and it’s made of wood. 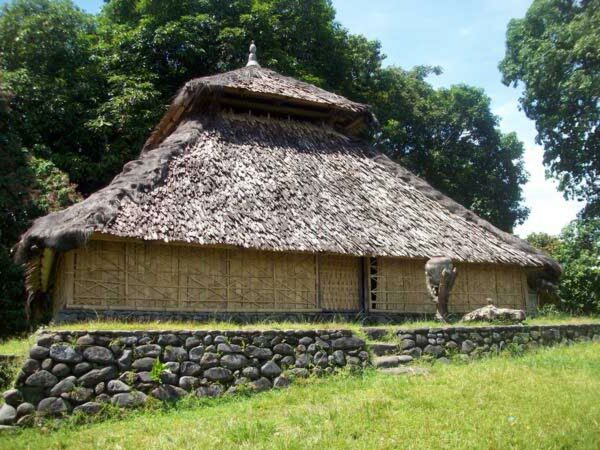 Yes, it took the man three natural materials to create the most ancient tourist spot in Lombok. Right in front of the Bayan Beleq Mosque, you’ll find an old earthen pot that was used to store a significant amount of water (it’s called a gentong). Another cool fact: this pot is tied to a semboja tree. Why is that, exactly? To help you cleanse your body before praying to the gods, of course! Don’t forget to bow before entering the mosque; otherwise, you won’t fit :). The drum in the corner is used to announce the time of prayers. And finally, the majestic pillars (4 in total) represent the unity of the Sasak people from the 4 villages that built the mosque together. Isn’t that absolutely magical? Take a closer look at those pillars: can you see the decorations? Every single one of them has a meaning (but we already knew that). The fish, for example, represents life on planet Earth in our regular bodies. The bird, in turn, symbolizes life after death, ascension. The idea is that we all have the capacity to find the perfect balance between Heaven and Earth. True, this concept is not new, and many religions have been “promoting” the same thing for many centuries. The dragon on top of the altar is home to three tiny birdies – they are the symbol of Wetu Telu, a religion that took its roots from Islam. And here are the three foundations upon which Wetu Telu stands: the government, the ancient customs, and the religion itself. Again, there’s nothing new in this interpretation, but when you’re standing in the middle of the Bayan Beleq Mosque, all these simple yet important words will have a life-changing effect on you. Fact: the mosque is not the only building in the area – there are 6 more. These graves hold the bodies of the first Muslim people that brought Islam to the village. Alright, that’s pretty much it for the Bayan Mosque. If you want to take some souvenirs back home, visit the cute shop that’s standing right in front of it all. There might not be as many stuff in that shop as you’d expect, but they will serve as great gifts to your loved ones, no doubt there. From Mataram, the ride to this mosque will take you about two hours. Yep, get ready for a long drive. A personal driver will make you feel like some kind of royalty, while a rental motorbike is the best option for the fans of the whole young, wild and free thing. If you’re traveling with kids, the best pick will be a taxi, because the local fellas know the place better than their own names and will take you there without any unnecessary stops and twists. The exact route is Mataram-Senggigi-Pemenang-Tanjung-Gangga-Anyar-Bayan. That’s important for the renting scenario. Public transportation is a drag – no better way to put it. And while the locals prefer public buses over renting/taxi, we, the foreigners, have the luxury of spending those racks like there’s nothin’ to it! Make a wise choice; otherwise, confusion, frustration, and a ruined adventure are guaranteed. Live a little, as they say. After all, the check won’t shock you, as the prices in Lombok are very low. Forget about everything else and concentrate on getting the most out of your trip to the Bayan Beleq Mosque. Definitely worth a visit. We had an awesome experience at this mosque and are thankful to the locals for guiding us. The kids want only one thing from you: money. That doesn't mean they're not adorable, because they are, but do keep that in mind. The background of the Bayan Beleq Mosque is more interesting than the place itself :). There aren't as many tourists in this place as I expected. But that means you have a chance to admire it on your own without any people messing up your mood. For me, it was a small disappointment. Maybe I expected more from "the most ancient mosque on the island" - it is what it is. Still worth a visit. Yes, it is made of natural resources, and that gives it an almost Biblical touch. My kids had no problem fitting in this short mosque.